Bet Auburn -2.5 over Washington at 888Sport. Bet Miami -3.5 over LSU at 888Sport. Bet Alabama -24.5 over Louisville at 888Sport. Bet West Virginia -10 over Tennessee at 888Sport. Bet Coastal Carolina +29.5 at South Carolina at 888Sport. It’s football time again in (arguably) the nation’s best conference, which means the smell of grilled meat emanating from tailgates, stifling humidity and soaring expectations from Columbia to College Station. The Huskies opened last season on the East Coast, pulling away in the second half to defeat Rutgers to start a 10-3 campaign. They’re back again this year — and facing a much stiffer challenge, against Auburn on Saturday in Atlanta for a 3:30 p.m. ET kickoff in a Mercedes-Benz Stadium that promises to be decked out in orange and white. Washington boasts a phenomenal offensive duo in quarterback Jake Browning and tailback Myles Gaskin. Auburn, 10-4 last season, counters by bringing back quarterback Jarrett Stidham and eight of its top 12 tacklers from a very stingy defense. Both teams can score. Both teams can defend. In the best matchup of opening weekend, the difference may be location, location, location. 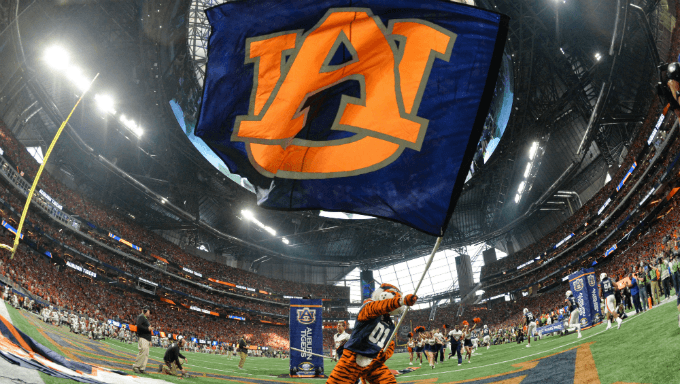 Bet Auburn -2.5 at 888Sport. The good news: LSU apparently at last has a quarterback, with Ohio State transfer Joe Burrow set to lead the Tigers into the opener 7:30 p.m. ET Sunday in Arlington, Texas. The bad news: this has been a tumultuous summer for a coach and a program that don’t need it after going 9-4 last season. LSU has a handful of players suspended, a number of others injured, and will open with zero previous starting experience at six positions on the depth chart. While this isn’t the 10-win Miami of a year ago, the Hurricanes have a dangerous returning quarterback in Malik Rosier, and an array of stout returning defenders — enough to stir the discontent in Baton Rouge for at least another week. Bet Miami -3.5 at 888Sport. Big numbers are scary; but so is the Crimson Tide. For all the hand-wringing over whether coach Nick Saban will start Jalen Hurts or Tua Tagovailoa at quarterback, Alabama really can’t go wrong with either one for this 8 p.m. ET Saturday kickoff in Orlando, Fla. The reigning national champions, who went 13-1 last season, will have as many as eight new starters on defense, which seems like a concern — but identical questions lingered entering last year, and the result was the nation’s best scoring defense. Alabama traditionally has plenty of defensive talent waiting in the wings, and it will reload against a Louisville team that underperformed at 8-5 last season even with a Heisman Trophy winner behind center. Bet Alabama -24.5 at 888Sport. The Volunteers have a new coach after the 4-8 debacle of last season, but Jeremy Pruitt can’t turn over Tennessee’s entire roster overnight. Pruitt is playing it coy going into the opener, not naming a starter at 10 positions, including quarterback, where holdover Jarrett Guarantano is among the candidates. West Virginia’s Heisman Trophy candidate quarterback, Will Grier — who will be playing before a hometown crowd for this 3:30 ET Saturday game in Charlotte, N.C. — leads nine returning starters on offense from a 7-6 team last season. Pruitt will need to work some magic from the jump, given how regularly Tennessee’s defense was torched last season, and how capable the Mountaineers are of doing just that again. Bet West Virginia -10 at 888Sport. South Carolina went 9-4 last year, but it ranked 12th in the SEC in both scoring and total offense. This week the Gamecocks are breaking in both a new offensive coordinator and new quarterbacks coach for their noon ET Saturday opener. Coastal Carolina, 3-9 last season is no threat for the upset — or really, to keep it close — but South Carolina doesn’t have the track record of covering a huge number under coach Will Muschamp, whose teams have historically been offensively-challenged, to put it mildly. The Gamecocks’ largest margin of victory under Muschamp is 26 points, and last time they won by 30 or more was 2014 — Steve Spurrier’s final full season at the helm. Bet Coastal Carolina +29.5 at 888Sport. Kentucky has made a habit under coach Mark Stoops of slugging out ugly home victories against lower-tier opponents. Last season’s 7-6 mark brought narrow victories over titans such as Eastern Kentucky and Eastern Michigan, the season before a loss to Southern Mississippi. Central Michigan, 8-5 in 2017, would seem a perfect candidate to follow suit for this 3:30 p.m. ET Saturday kickoff. However the Chippewas lost their starting quarterback, three top wideouts, No. 1 tight end and best three defenders off last year’s bowl team, while the Wildcats return star tailback Benny Snell and enough solid offensive pieces to offset the presence of a new starting quarterback. Bet Kentucky -17 at 888Sport.